As professionals in end-of-life care, our responsibilities can seem overwhelming. As with other clinicians, we have burdens of too many patients to see, too much time spent in documenting, and hassles with insurance companies. 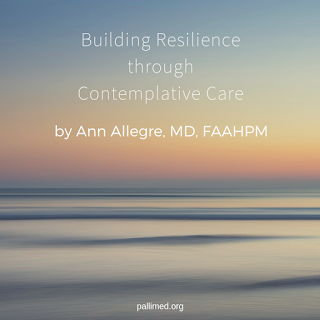 In hospice and palliative medicine, we are impacted by the additional challenges of seeing so much suffering, grief and tragedy. While we have good tools to address most types of physical suffering, there is much suffering among our patients and their families that does not respond to medical interventions. After I had been working full-time in hospice and palliative care for a few years, I felt that I was burning out. In 2003, I took training in a contemplative approach to care, which stabilized me and allowed my career to flourish. I gained new tools for addressing the suffering that I could not relieve with medications, and I learned how to have more compassion for myself. Dr. Balfour Mount said “Our effectiveness as healers is determined by our openness, self-awareness and capacity for radical presence.” These factors describe the contemplative approach. It is about how we are present to one another. Presence is developed by applying the methods of meditation to help us deeply connect with our essence, the best part of our being. We bring this non-judging openness and kindness into our interactions with others. More than anything, what helps someone who is suffering is how we are. The contemplative approach helps to free us of our ordinary approach, which is based on self-judgment and hopes and fears about how I am doing in this situation. We learn to be present with ourselves so that we can be present with others. We each have an innate capacity for genuine compassion, which can be cultivated and strengthened. What does training in contemplative care offer? Contemplative methods for deepening compassion and self-healing reduce stress levels and bring a sense of joy and confidence to our work. We can also learn methods of contemplative listening and communication, so that we can truly connect with people in crisis and create a healing environment. It is a practical approach that can be immediately applied in encounters with patients and families, as well as interactions with our colleagues and personal family and friends. After my own initial encounter with a contemplative approach to care in 2003, I sought further training. I have been privileged to share this work with others as an instructor for the Spiritual Care Programme, an international training program founded more than 30 years ago that has trained over 30,000 healthcare professionals worldwide. Skills of compassion and presence are needed more than ever in this difficult world. Whatever avenue you choose, I hope that each of you will find your way to this type of peace and fulfillment to your work. 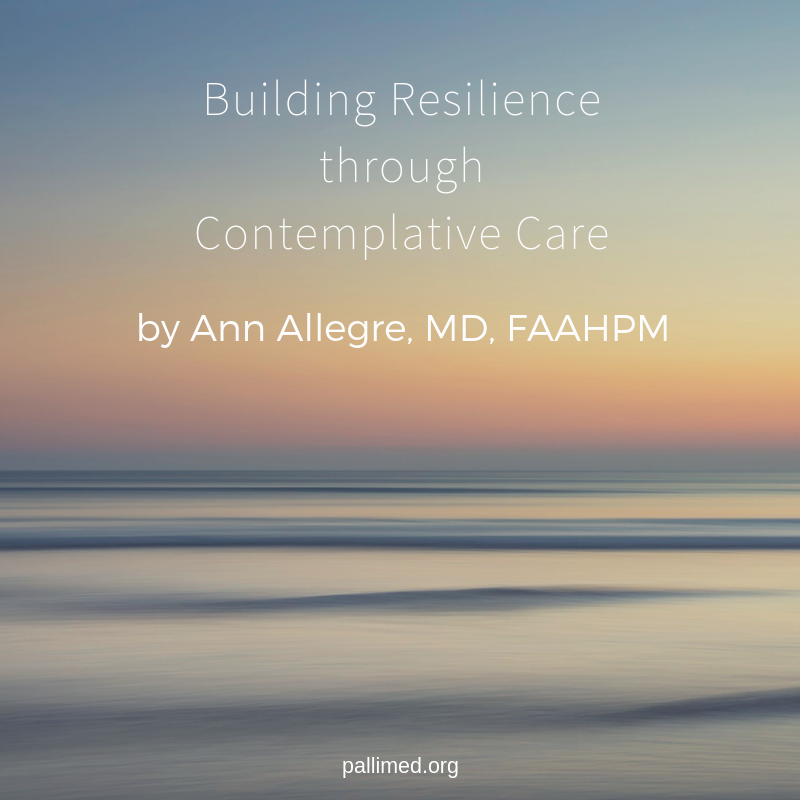 Ann Allegre, MD, FAAHPM is a Senior Educator for the Spiritual Care Programme and a retired hospice and palliative care physician. She may be reached at ann.allegre [at] spcare.org.